For the last three years, the students at Brinson Memorial Elementary have learned about the impact of dirty water on the people in third world countries. As a school, we decided we wanted to make a difference in the world. We realized that one person can make a difference, but if we all work together we can change the world. One way we could do this was to earn money to build a well so these people could have clean water and we could change their world. The children worked hard doing various jobs around their houses and in their neighborhoods to earn money. Of course we accepted donations also. 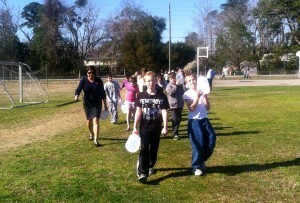 Each year on World Water Day in March, our students walk a mile carrying a gallon milk jug filled with water to get an idea of what the children in third world countries do each day in order to bring water to their families. Of course, a lot of the time the water they bring home is dirty. Because of the hard work of our students and generous donations from the community, in 2013 we were able to build a well at the Bunonko Primary School in Uganda. Last year (2014) we built a well in the Kinyara/Kyamugiri Village also in Uganda. What a blessing for the children and the community to have clean water! This year we set our goal at $4000. Please help us reach our goal and hopefully go beyond this goal so we can bring clean water to another group of people.